Helping Heart Families » Aubree - Gavin's Got HeartGavin's Got Heart - Our mission is to spread congential heart defect (CHD) awareness while offering support to families with children affected by CHDs. Aubree Elizabeth was born August 11, 2015. She was diagnosed with Hypoplastic Right Heart Syndrome with an intact ventricular septum. She has had numerous surgeries with lengthy hospital stays and continues to struggle with lung development due to her heart defect. Three of Aubree’s surgeries took place at Boston Children’s Hospital and the most recent was performed at New York Presbyterian to untether her spine. 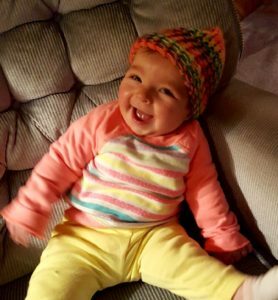 She receives occupational and physical therapy five days a week in an effort to close a 3-4 month gap in developmental milestones. Despite the unthinkable obstacles this heart hero has faced in her short life, Aubree continues to amaze everyone with her strength, resilience, and infectiously joyful smile.